“Thanks so much for all your help in making Becca and David's wedding the beautiful simcha that it was. We got many, many compliments about you! It was a pleasure to work with you and we really appreciate how easy and enjoyable you made things. “Heartfelt thanks to you and your colleagues. My daughter's wedding was perfect, and one reason is because you gave us exactly what Miriam and Chaim wanted. You played the music they requested and avoided the music they didn't want. You played the specific songs they asked for as well as the styles they asked for — and it was all done beautifully, by talented musicians. 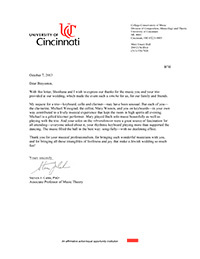 “We wanted to thank you so much for playing at our son's wedding several weeks ago, and for your all of your assistance in preparing the music for that event. As you know, we were trying to blend both secular and religious music at the wedding. Your knowledge of both kinds really, really made our lives so much easier. Not only did we rely on you to provide the religious music at the Chuppah, you also helped us come up with appropriate secular music for those (including the bride) who were marching down to a more secular tone. We are most appreciative. “Shoshana and I wish to express our thanks for the music you and your trio provided at our wedding, which made the event such a simcha for us, for our family and friends. My request for a trio — keyboard, cello and clarinet — may have been unusual. But each of you — the clarinetist, Michael Winograd, the cellist, Mary Wooten, and you on keyboards — in your own way contributed to a lively musical experience that kept the room in high spirits all evening. Michael is a gifted klezmer performer. Mary played Bach solo music beautifully as well as playing with the trio. And your solos on the vibrandoneon were a great source of fascination for all attending — everyone asked about it; your rhythmic keyboard playing more than supported the dancing. The music filled the hall in the best way: song - fully — with no deafening effect. Thank you for your musical professionalism, for bringing such wonderful musicians with you, and for bringing all those intangibles of liveliness and joy that make a Jewish wedding so much fun! “As soon as we connected with Binyomin, planning all things music-related became an entirely stress-free experience. The groom and I were both looking for something tailored to our own tastes but didn't want to compromise on the traditional tunes that our guests would expect to hear. Binyomin was extremely accommodating in terms of helping us hammer out a set list that we were both comfortable with and excited about, but his through-and-through knowledge of the ceremonial side of things really assured us that everything he'd be involved with would be anchored in tradition as well. “We wanted to thank you for your excellent musical provisions at our wedding last Sunday at the Prince George Ballroom! From the ceremony to the mezinka, our guests raved about the music, and we were thrilled with it as well. Thank you so much for your patience and flexibility while we sorted out our ceremony selections. You and your team executed our eclectic selections with style and ease, and made walking up and down the aisle anything but a stodgy experience. Thank you for your flexibility as we fell behind schedule due to the Polish Day parade. We were so happy that you could stay on to make our celebration fantastic. “Our wedding was in Washington DC, and we hired a local band that we loved, but their expertise was not the Jewish music we were hoping for. Many phone calls and emails later, we connected with Binyomin. We cannot thank Binyomin enough for his musical creativity, energy, and flexibility. Playing with our band for the first time on the night of our wedding, Binyomin delivered everything we could have wanted and more. (Binyomin was so great to work with, even our band leader said he'd love to do another event with him). “We cannot thank you enough for making Allison’s Bat Mitzvah the most amazing event!!! The phone calls are non-stop about the wonderful “Jewish Musician’s Trio” who kept the party going all night long!!! Everyone was impressed with the quality of the music and the lively, inspirational atmosphere. This was not an easy crowd to please as it was very diverse. There were about 125 children from various ethnic and religious backgrounds, and probably the same number of adults with diverse backgrounds as well. Nonetheless, everyone was up and dancing and having a wonderful time. We received a call today from a friend of ours who said that she still is “sore” from the longest and best hora that she’s ever seen or been part of. We can’t thank you enough. You have been a pleasure to work with, and we hope that you’re available for our twins’ bat mitzvah in two years. “The music at the reception was absolutely perfect. The volume was loud enough for everyone to hear but we heard absolutely no complaints from anyone that was it was disturbing them or making it too difficult to carry on a conversation. “My son expressed all of our feelings about the job you did far better than I could. The only thing I would add was how beautiful the music was for the Chupah. My wife and I had a violinist at our simcha almost 27 years ago, and I think the music at Chana and Andrew’s Chuppah was just as beautiful and memorable. “Thank you so much for your assistance in providing music for my parents’ 60th wedding anniversary party. The harpist and violinist you sent us were perfect. They were obviously talented, and yet were able to maintain the background music effect that we sought. They were well paired, and their playing styles complemented each other beautifully. It was clear that you spent considerable time figuring out which musicians would mesh well together. In addition, I want to reiterate my gratitude for the way you prepared the musical selections for the evening. We wanted background music, yet we wanted some music that was from the era of my parents’ wedding. The selections you chose – classical, standards, and some traditional Yiddish tunes – accomplished exactly the mood that we sought. Guests mentioned numerous times how wonderful the music was. “The Binyomin Ginzberg Trio performed in the reception area for the first day of the annual convention of the Association of Jewish Libraries which took place on June 17, 2004 in New York and which was attended by over 300 librarians. The program was also open to the public. “We were married on September 30th, 2001; Binyomin Ginzberg led the energetic, fresh, and innovative wedding band with a unique perspective. The musicians love their job and truly have fun performing. Our parents’ friends tell them that they’d like to make a simcha just to have an excuse to hire the band. Our friends all tell us how much they enjoyed the band and how lively the party was. The band was very energetic. The strolling klezmer was a big hit! Guests marveled how the band strolled around the room during dinner, while playing their instruments. They take their job seriously. They take the time to understand what you need to ensure that you enjoy your own party.